When coming to the festival, part of the joy is being able to find previously undiscovered treats in the rather thorough exploration of European cinema that takes place each year. What it can also become is a test of your nerve as a reviewer. This blog is, as always, painfully behind (I’m sat writing it almost two weeks after the festival has finished, having started it on the last afternoon of the festival), but I’ve done a huge amount of other writing, radio and generally putting myself about the place. I’d say about half of the films I’ve seen only had a limited supply of reviews online, sometimes just two people and a dog that happened to see it at the last festival it played at while it tries to get enough momentum to get a release, but you can watch films free of other people’s expectations. The flip side of that is that, by doing the kind of things I do, you actually become the expectation setter. The moment you form an opinion and put it online, someone else will use that opinion as part of their cultural barometer and in the case of festival films, there’s even a chance you might be their only opinion. I created a Letterboxd list of all of the feature films playing at the festival, but I’ve had to add two of those myself so I am currently the only opinion former on the whole site. That’s one thing when you’re just slapping on a star rating but entirely another when you’re cobbling together half a thousand words to explain your deepest thinking on why this unheard of film is a masterpiece / turd / just OK.
What the Wednesday of Cambridge Film Festival 2014 turned out to be was my best day of the festival in terms of quality – at least as far as I saw it. An extraordinary and fascinating film Distance is further proof that Sergio Caballero is an idiosyncratic talent setting new boundaries in cinema. Essentially a heist movie, but like no other. Three Russian dwarves are sent to rescue a performance artist in an abandoned Siberian power station where strange things are happening. The dwarves communicate through telepathy and have telekinetic powers that allow them to move objects, hear long distances and communicate across continents. If you’re not instantly sold by that description, then you may be reading the wrong blog. If I were to be reductive, then I would describe it as Ocean’s Three with telepathic dwarves in a loose interpretive remake of Andrei Tarkovsky’s Stalker; but I’m not a fan of reductionism so forget I ever said that. I’ll be honest, though, for while I loved The Distance it’s not going to be everyone’s cup of tea. It’s moody and understated, with the humour erring on the dark side, but fans of surrealism like myself it’s a beautiful playground in which Caballero continually finds new ways of subverting your expectations. It’s difficult to judge elements such as performance because none of the three dwarves are Russian, instead their telepathic thoughts are dubbed over by Russian speakers, and they are not alone: for example, there’s a Japanese bucket with a fondness for haiku poems. What makes The Distance work is its strict adherence to the heist movie structure, with title cards indicating the dates and that keeps the movie just about grounded enough to allow the coterie of strange characters and the twisted plot elements to work. The film also played with a short, Ancha es Castilla / N’importe quoi, which couldn’t be further removed from the main feature. If The Distance is an extended David Lynch fever dream played out in a desolate Spanish landscape very effectively doubling for Siberia with high production values, then Ancha is like a discarded Reeves and Mortimer cut scene with no production values whatsoever. It’s an exorcism story told with characters who are made out of food, and who are occasionally played by people dressed up as food, and it’s the excitable, grungier younger brother to its more austere feature cousin. Apparently Caballero’s first movie, Finisterrae, is a road movie for ghosts, played by two people wearing sheets with eyes, one of whom rides a horse. Sold! Audience reaction: I saw this on a screener, and was doing other things at the cinema the following evening, so just popped in for a brief period. You can always tell when an audience isn’t quite engaged through the amount of shuffling and throat clearing going on, and when some of the other Take One writers emerged the reactions ranged from bored to perplexed to freaked out. But I loved it, and that’s all that matters here. Dietrich Brüggemann’s film, written with his sister Anna, is composed of fourteen largely static takes in single shots, intended to evoke the fourteen stations which adorn so many church naves and which tell the story of Jesus Christ’s crucifixion and death. The stations in churches provide an opportunity for Christians to meditate on the suffering and sacrifice which they believe the Son of God endured, and Brüggemann’s stations deal with the suffering and torment of a teenage girl, Maria, approaching her confirmation service in a church still attempting to adhere to a stricter Catholic doctrine than the church of Rome. This more fundamental approach to life sees Maria ostracised by most of her classmates for not exercising at school to what she believes to be demonic music (and which is actually Roxette’s The Look, so maybe she has a point). Other than one young friend who appears to have romantic leanings for her but who attends a more liberal church with gospel music (also demonic), Maria has no outlet for her frustrations and the oppressive attitude of her puritanical mother, mixed with her interpretations of her pastor’s religious teachings, send her down a dark, tragic path. Brüggemann seems not to be judgemental of faith itself, but of the consequences of unquestioning acceptance of religious dogma and the interpretation of faith. Full disclosure: I am a Christian, but a fairly liberal one (as are some of the minor characters here, each of whom is portrayed as more tolerant and reasoning than Maria’s family and church) but I don’t think you need to have a faith of your own to appreciate the message Stations Of The Cross is imparting. The fixed shots serve a variety of purposes: as well as imitating the “moment in time” of the tableaux of the stations, there’s a claustrophobia to the scenes almost as if Maria’s fate is inescapable, and the dramatic tension on the few occasions when the camera is allowed to pan or track are intensified. Brüggemann also draws two outstanding performances from his leads, Lea van Acken as the tormented Maria and Franziska Weisz as her overbearing mother, and despite the inevitability of the outcome almost from the first scene, Stations Of The Cross expertly explores themes of society, faith and family and composes a searing drama in the process. Audience reaction: While I was on my own with The Distance, the consensus of those I spoke to after the festival was that this was one of the films of the festival. Thankfully it’s back in cinemas for a limited release late in November and not just confined to the festival. By this point in the week, it can become difficult to remember my own name or where I live, so I’d ask anyone whom I told that Down By Law was taking my Jim Jarmusch virginity to forgive me; I had completely forgotten this year’s Only Lovers Left Alive, which may yet secure a place in the hallowed Top 40 of the year in a few months. Having forgotten that may be why I had this perception of Jarmusch films being dour and introspective, which on the evidence of these two is totally unfair. 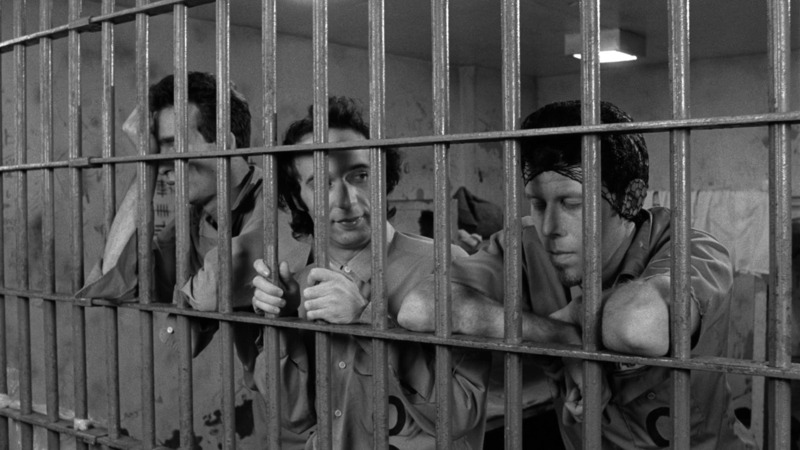 Down By Law brings together three criminals, a disc jockey (Tom Waits) and a pimp (John Lurie) who have both been set up for crimes they didn’t commit, and Bob (Roberto Benigni) who’s an Italian tourist imprisoned for manslaughter. The three are pulled away from their normal lives and Waits and Lurie allow their frustrations to drive them to blows before Benigni suggests an escape plan and the three go on the lam in the bayou. You may or may not subscribe to the idea that most stories have a three act structure (and I’m at risk of being reductive again), but Down By Law certainly has three distinct moods. Jarmusch shifts effortlessly through the gears from the downbeat broodiness of the characters’ civilian lives, to the bickering of the prison and eventually to an almost romanticised fantasy of the countryside post-escape, but at every turn there’s a simmering undercurrent of danger and uncertainty. It looks fantastic, even with the monochrome palette, and also sounds great thanks to Waits’ bookending songs and it’s all hugely enjoyable for a variety of reasons. Waits, Lurie and Begnini make the most unlikely of trios, but Jarmusch will have you rooting for them as they flee their prison (and how strange to have a prison movie with no interest in the actual mechanics of the escape, which all happens off screen), and any movie which can make you root for Roberto Benigni must be doing something very right. Audience reaction: For a film shown at 11 p.m. on a Wednesday evening, the buzz of the audience as they left the screening was testament to just how well Jarmusch’s film holds up now, nearly thirty years later. This entry was posted in Cambridge Film Festival, Reviews and tagged 2014, Cambridge Film Festival, Down By Law, film, movies, review, Stations Of The Cross, The Distance. I’m currently writing reviews for Take One at the Cambridge Film Festival as well as blogging. This review will eventually be hosted on the Take One website, by which time it will have had a proper edit and be all shiny, but technical issues are currently preventing that, so until that time I’m hosting the unedited review here, as the film is showing this evening (Thursday) at 20:30. It will eventually be replaced here by my daily blog of the festival. Don’t forget to check out Take One for all of your Cambridge Film Festival coverage. Surrealism can be a tricky thing to get right. When you start to see objects as characters and when your defining purpose is to find what’s illogical rather than logical, if you’ve failed to ground your world in something substantial then it’s all just a collection of images, no matter how interesting those images might be. Sergio Caballero’s second feature employs both a very physical grounding, in the environs of a derelict power station, and also uses the distinct structure of a heist movie to give shape and form to his imagination. While the sense of the form is conventional, almost a staple of the language of film, the details layered over it most certainly are not. Taking an inspiration from David Lynch, Caballero has cast not one but three dwarves as his central characters, a trio with various psychic powers that they use to be able to conduct their business. Additionally, they (and all of the other characters, whether animate or inanimate) are telepathic, speaking in a variety of languages but able to clearly communicate. Their services are required by a performance artist who was bought and installed in a Siberian power plant by a now deceased Russian oligarch; the artist seeks an object held at the same facility called The Distance and the dwarves concoct an elaborate plan to acquire it for him. Caballero has stated in interviews that he no longer watches anything but children’s television, believing other culture will contaminate his own creative process. Maybe because of that he’s chosen as his leaping off point elements from Andrei Tarkovsky’s film STALKER, but instead of The Zone, The Room, The Writer and The Professor as in STALKER, Caballero has The Bucket and The Chimney in addition to The Distance. Other elements, from the telekinesis to the oppressive Russian landscape, also have their roots in Tarkovsky’s work, although the sexually-obsessed dwarf whose powers are activated by scratching his crotch and then sniffing his fingers appears to be entirely of Caballero’s invention. What keeps THE DISTANCE watchable throughout is the relationship between the three central characters. Caballero’s process involves taking ideas recorded on his iPhone, then expanding them on set and only finally forming the narrative in the editing suite, so it comes as a pleasant surprise that the narrative underpinning the film is as coherent as it is. Within that the dwarves’ relationships, a three way odd couple that provides both occasional flashes of emotion and humour which give the bedrock that allows the more eccentric elements to flourish. 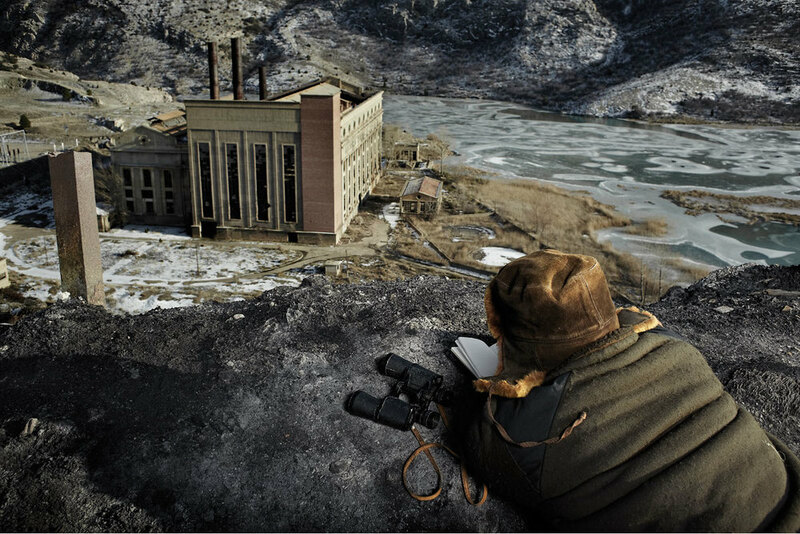 There are other character successes within the film, most notably a haiku-spouting Japanese bucket, but THE DISTANCE is primarily a visual film and on that level is impressive, Caballero’s imagery perfectly complemented by Marc Gómez de Moria’s cinematography which finds beauty in the harsh Spanish landscapes doubling for Siberia. ... there’s lightness and hope among the depression and despair in the world that he’s created. Given his aversion to modern culture and his inspiration from Tarkovsky, THE DISTANCE would seem to be Caballero’s attempt to puncture the pomposity of some of the darker recesses of cinema. There’s lightness and hope among the depression and despair in the world that he’s created, but it’s the darkness that’s the dominant force. Rather than the approach of early classics of surrealist cinema, which sought to find disturbing images or horror among the mundane, Caballero instead finds glimmers of human truth and dark comedy among the freakish, but if his primary goal was to entertain, it’s one he’s achieved admirably. While The Distance itself feels very much a MacGuffin, the final reveal still makes for a memorable climax to an arresting film. THE DISTANCE is screening at the Cambridge Film Festival alongside the short, ANCHA ES QUESTILLA / N’IMPORTE QUOI, which while equally surreal is anarchic, boisterous and deliberately messy, in sharp contrast to almost every element of THE DISTANCE. Mixing puppets made of food with actors occasionally playing the same characters, it’s a story of exorcism that draws inspiration from other surrealists and for anyone that might find THE DISTANCE too remote or abstract, the daft liveliness of ANCHA ES QUESTILLA should provide a thorough antidote. This entry was posted in Cambridge Film Festival, Reviews and tagged 2014, Cambridge Film Festival, film, movies, review, Sergio Caballero, Take One, The Distance.